This Jardiniere stands 10" high and is 12" in diameter. It is very heavy, handpainted, crazed inside and out, there are no markings, and the bottom is a tan color almost like stoneware. There are 4 different enamelled emblems on the upper brown band. This came from an antique store that closed 7 years ago. This Jardiniere is of Chinese Porcelain and made in the city of Jingdezhen, Jiangxi Province, in the Guangxu (1875-1908) period. It displays features from traditional Chinese potter's art such as the gray, crackled "Ge" glaze and an etched, iron brown border referring back on the ancient Chinese bronze art. 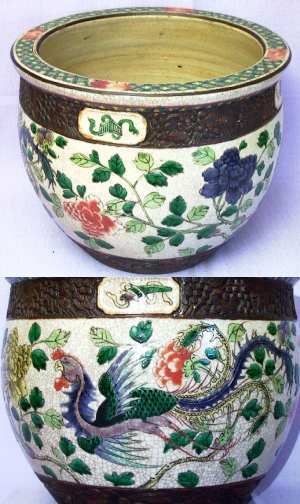 The decoration in itself is made in the style of Kangxi (1664-1722) period "Famille Verte". Pieces of this characteristic type often displays an iron red stamped reign mark or a mark etched in brown, while this Jardiniere is unmarked. The 4 different enameled emblems on the upper brown band are four of the Chinese "Eight Precious Things" who often occur as decorative motives and sometimes individually as porcelain base marks. The full set are the Jewel or "pearl", the Cash coin, the Open Lozenge, the Pair of Books, the Solid Lozenge, the Musical Stone, the Pair of Horns and the Artemisia Leaf. Of these we can see the Horn and the Musical Stone on this picture. The decoration of Phoenix bird (emblem of the Empress) and Peony flowers (female beauty) are both strong in the Chinese "Yang" force and might make this beautiful Jardiniere fit perfectly in the home of a young lady. Careful though. It is old, powerful forces we are dealing with here.